I have been using Juice Beauty products – the Blemish Clearing Cleanser, Blemish Clearing Serum and the Oil-Free Moisturizer – since early January. My initial review of the product was good but questioned whether one needed to spend so much money on a brand with results comparable to other, less expensive brands. Prior to using Juice Beauty, I was (and still am) a fan of Oil of Olay Foaming Face Wash for Sensitive Skin and returned to this product after exhausting my bottle of Blemish Clearing Cleanser. developed an outbreak of tiny bumps that extended from my chin to my left cheek. I realize that sometimes it takes a while for one’s skin to adjust to beauty routine changes. However, I never experienced an outbreak when I switched to Juice Beauty. Hmmm, that got me thinking. One, Juice Beauty make actually be the real deal, a truly organic cleansing system. As gentle as Oil of Olay Foaming Face Wash for Sensitive Skin is, it still shocked my skin. And two, sometimes you have to pay the price for the results you want. 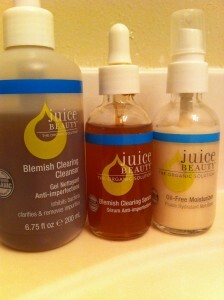 Not only had I noticed how clear Juice Beauty was making my complexion, but others had noticed as well. So, looks like I’m headed to the Juice Beauty website to order another bottle of Blemish Clearing Cleanser. I still have a fair amount of the Blemish Clearing Serum and Oi Free Moisturizer. It is, for me, an expensive product, but it is well worth the money if you want clear skin.